Arielle Gold of United States competes in the superpipe finals during the Dew Tour event Friday, Dec. 15, at Breckenridge Ski Resort. Chloe Kim of the U.S. competes in the superpipe finals during the Dew Tour event Friday, Dec. 15, at Breckenridge Ski Resort. Kim took home first with a high score of 93. 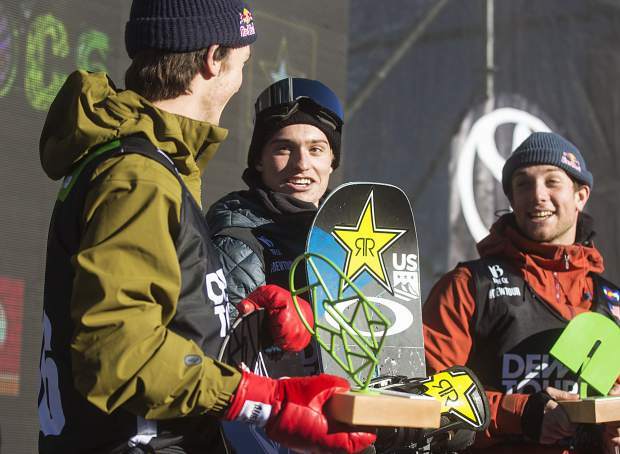 Eagle product Jake Pates, at top of podium, of United States interacts with Scotty James, far left, following the superpipe finals during the Dew Tour event Friday, Dec. 15, at Breckenridge Ski Resort. 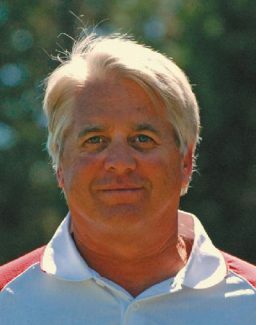 Pates took home first with a high score of 97. 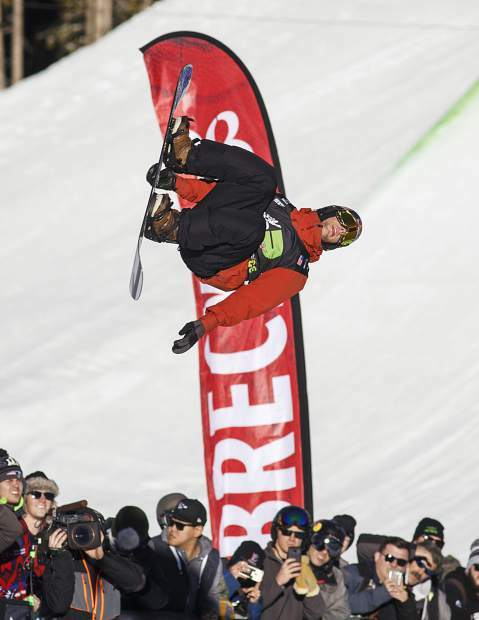 Ben Ferguson of United States competes in the superpipe finals during the Dew Tour event Friday, Dec. 15, at Breckenridge Ski Resort. Scotty James of Australia competes in the pro ski superpipe finals during the Dew Tour event Friday, Dec. 15, at Breckenridge Ski Resort. 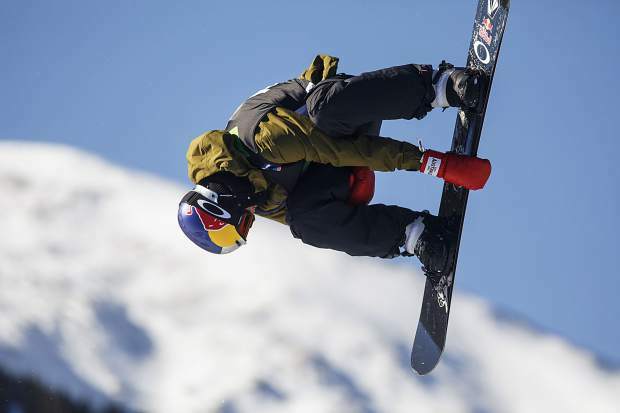 Eagle product Jake Pates of United States competes in the superpipe finals during the Dew Tour event Friday, Dec. 15, at Breckenridge Ski Resort. 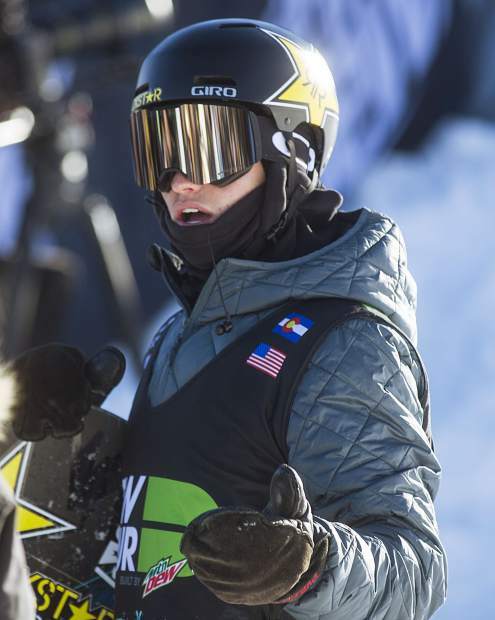 Eagle product Jake Pates of the United States reacts to his high score of 97.33 from the superpipe finals during the Dew Tour event Friday, Dec. 15, at Breckenridge Ski Resort. 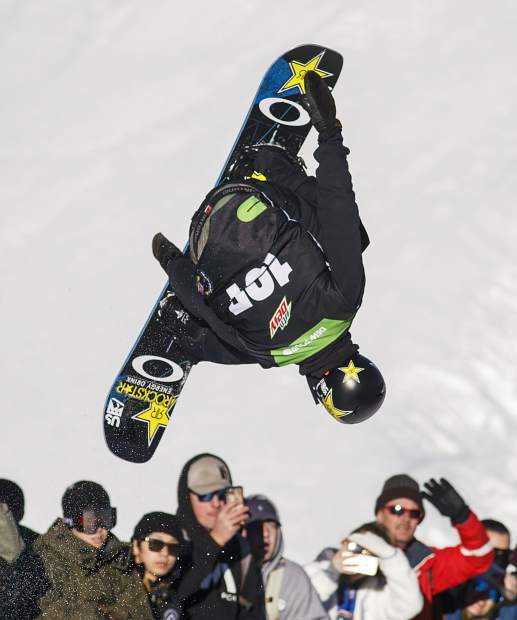 Pates took home first in the Dew Tour's snowboard superpipe finals. 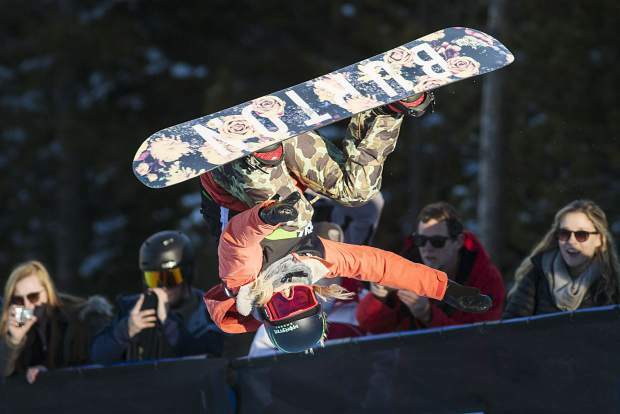 A week after she took first place at the U.S. Olympic qualifier at the U.S. Grand Prix at Copper Mountain Resort, 17-year-old Chloe Kim became the first U.S. snowboarder to qualify for the Olympics via another win at Friday’s Dew Tour. Kim pieced together a 93.00 on her first run to take the ladies superpipe title on the strength of consecutive 1080s, a back-to-back move that distinguishes the Pyeongchang gold medal favorite from any other female snowboarder in the world. Last week at the Copper Mountain Olympic qualifier an American trio swept the podium, a team accomplishment that was repeated on Friday, though with a slightly different combination. 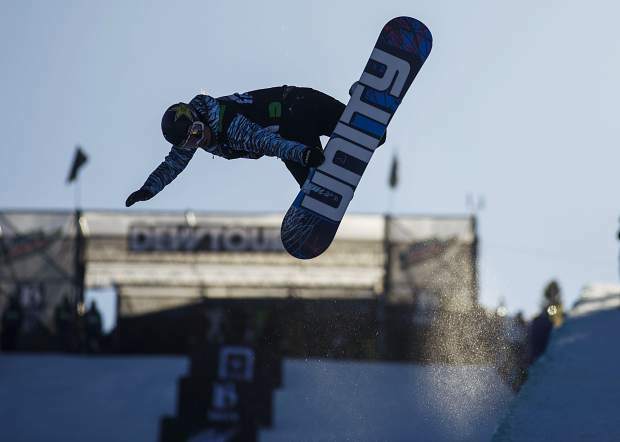 Kim and second place finisher Kelly Clark (90.00), were a part of the trio again while Arielle Gold (87.00) edged out last week’s second place finisher Maddie Mastro (84.33) to make the Dew Tour podium. 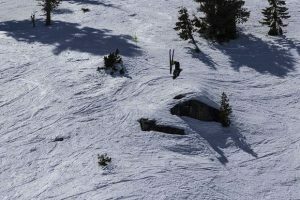 The Olympic veteran Clark managed to put together the 90.00 run on her final turn after she had a scary injury on her second run, slamming the bottom of her board into the halfpipe lip. Though she had a bandage over a bloody nose, once Clark was cleared by medics, she didn’t hesitate to return to the top of the pipe and give it her all.